Ownership / Access: Managed by the Fondazione Musei Civici di Venezia. Notes: The Clock Tower in Venice is an early renaissance building on the north side of the Piazza San Marco at the entrance to the Merceria. 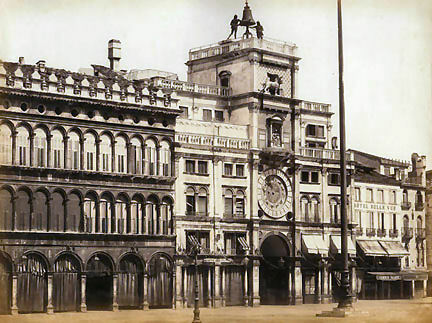 It comprises a tower, which contains the clock, and lower buildings on each side. It adjoins the eastern end of the Procuratie Vecchie. Both the tower and the clock date from the last decade of the 15th century, though the mechanism of the clock has subsequently been much altered. It was placed where the clock would be visible from the waters of the lagoon and give notice to everyone of the wealth and glory of Venice. The lower two floors of the tower make a monumental archway into the main street of the city, the Merceria, which linked the political and religious centre (the Piazza) with the commercial and financial centre (the Rialto). Today it is one of the 11 venues managed by the Fondazione Musei Civici di Venezia. Stairways (steep and narrow) inside the building give access to the terrace on the roof, passing the clock mechanism on the way. Tours (in Italian, English and French) must be booked in advance.